I do not care what the calendar says. As far as I am concerned, the new year does not start until a good time after February 2nd - usually not until sometime towards the end of March. Truly, how can one feel that they are beginning anew when the world is still trapped under a blanket of snow? I am a person wholly affected by my surroundings. As I have alluded to before I tend to have strong reactions to changes in the weather. And, like most I’m sure, I tend to eat in response to what’s going on outside my window. With the grey days of early spring just settling upon us, I find myself eagerly awaiting the bourgeoning brightness of April and May. I have been keeping a steely eye on our neighbour’s lawn and our green grocer’s inventory to see the return of a green palette - in shades of grass, asparagus and pea shoots. Sadly, I am a bit ahead of Mother Nature, who is still enjoying the last vestiges of her beauty sleep. Today dawned cloudy and cold, with a crisp, howling wind to greet us. It seemed somehow fitting that I turned to my freezer for comfort as I spied a bag of frozen petit pois (small, sweet peas). Even though my landscape is still drab and monochromatic, at least my bowl is filled with the promise of the months to come. My apologies to any readers outside the Northern Hemisphere for this weather-centric post. Happy autumn to you all! 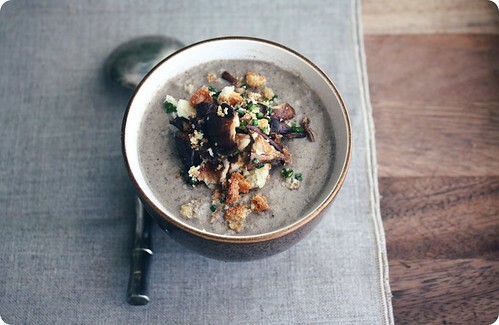 This creamy, yet fresh tasting soup is delicious served either hot or chilled. 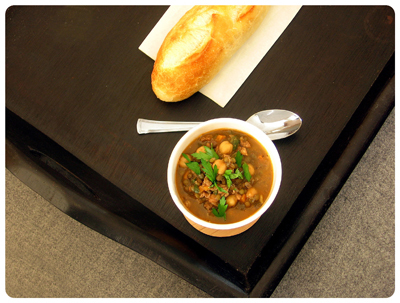 While I wanted a pure, unadulterated pea taste in this soup, herbs would be a natural partner. A few sprigs of mint, chives or flat-leafed parsley could be added while puréeing. In a small saucepan over medium low heat, melt the butter into the olive oil. When foaming has subsided, add the shallots. Season with salt and sweat the shallots until translucent, about 2 minutes. Add the stock and bring to a boil. Add the petit pois and cook until bright green and just tender. This depends on their size, but should only take a few moments. Using an upright or immersion blender, purée the soup until very smooth. If using the upright blender, be careful about blending hot liquids - you might want to allow it to cool before attempting. Or, undo the centre of the lid to vent out the steam, covering the hole with a kitchen towel. Add the lemon juice and cream (if using), season with salt and pepper to taste. Drizzle with additional olive oil for garnish, if desired. Serves 2 for a light lunch with a salad, or one who's feeling hungry. • You can play with the aromatics in this recipe. Leeks would be a fine substitution for the shallots. 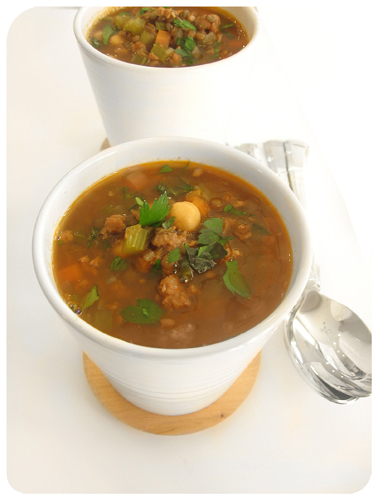 • Added at the end, a dash of cream or an additional dab of butter to this soup adds a wonderful richness to the finish. I have only just begun to wake up from my holiday-induced hibernation. Never mind the early arrival of darkness, the cosy fires and inviting couch; it has been a blanket of sugar, butter and cream that has kept me in this sedative state. As others seem to agree, this post-festive season lull allows for a bit of sensory recuperation; an opportunity to recharge after an onslaught of tinsel, twinkling lights and sheer gluttony. It is during times like these I tend to crave immediacy of flavours - I have no patience for subtlety. I want to dispel this midwinter fog with the brightness of summer-hot chilies, the unapologetically verdant hit of cilantro and the acidic tang of limes. Each flavour distinct, no long-simmered blending to cloud their impact. While I would love to be able to say that I had the energy and the wherewithal to tackle an authentically Thai or Chinese preparation, it is January and I’m still feeling slightly delicate. So instead I turn to an old friend and standby; my Mother’s vaguely Asian chicken-corn soup. A taste directly transcribed from my childhood, this soup made an appearance whenever we had home-made chicken stock on hand. Served in small white bowls with a fluted edge and a rim of gold, it always felt like a special occasion. It is astoundingly simple to make, forgiving in its quantities and with great allowance for improvisation. Borrowing from various cuisines, this dish delivers the clarity of flavours I so crave, with minimal fuss. My variation on her creation, with thanks. 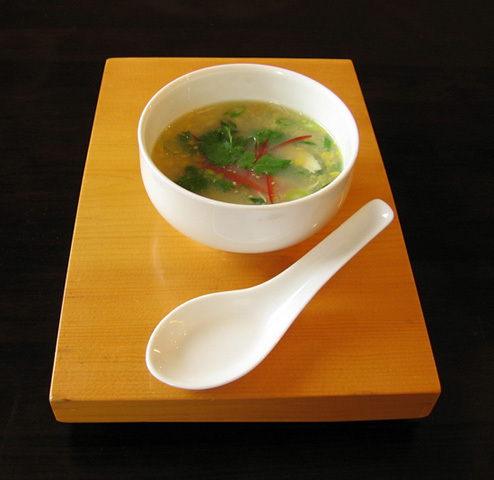 In a medium saucepan, over medium heat, combine stock, water, the white part of the green onion, ginger and garlic, if using. Bring to a simmer, and allow to steep for 5 minutes, until the broth is fragrant. Add the shredded chicken, corn and chili sauce/oil, reduce the heat to medium-low and gently simmer for another 8-10 minutes. Finish with the reserved green onion, a few drops of sesame oil and the cilantro leaves. Stir through to combine. Check for seasoning. Serve with a sprinkling of julienned chili and a spritz of lime, if desired. • Home-made chicken stock is my preference, but there are some excellent store-bought alternatives available. I would use a low-sodium variety. • I’ve not included a quantity for the ginger, as it really depends on your taste and mood. When I am looking for assertiveness I will throw in a few 1 inch matchsticks, while I’ll simply grate in a hint when I want just a background earthy heat. Trust your own judgement. • Canned cream-style corn is readily available (and another childhood favourite), but I highly recommend Alton Brown’s version, omitting the rosemary from his recipe. • If you do not have chili sauce/oil on hand, I would add a few pieces of the julienned chili to the stock as it simmers, reserving some for garnish. • My mother would always scramble an egg into the soup to finish - as one does with egg drop soup. She would bring the soup to a boil and then, in a thin, steady stream she would stir in the beaten egg. • For a vegetarian variation, substitute the chicken stock with vegetable stock and omit the chicken. In this version, you could also use a can of baby corn instead, adding vegetable dumplings and/or Chinese greens. I must admit, I’m feeling a bit burnt out. Since the aforementioned conference ended Saturday afternoon, I’ve been in a waking-comatose state. It seems a few days of information-laden presentations, politicking, and incessant schedules, all topped off by being away from one’s own bed, takes a toll. Truthfully, it made me a tad bit batty. In all seriousness, since my return I’ve done nothing of note. I’ve pottered around the house, did a bit of cooking, some cleaning and organizing, but no major projects, nothing truly productive, and I couldn’t be happier. Being away made me realize how much I love my home and my city. Absence makes the heart grow fonder and all of that, but I hadn’t realized how much I identify myself with my surroundings until this little sojourn. I am truly a homebody, and happy to admit it. While I love travel, I long for home. Chubby Hubby has been asking the foods we’d travel the world for – and I could immediately volunteer a list of dishes. A slice of pizza from Lachine Arena Pizza in Lachine, the sweet potato and blue cheese fritters (no longer on the menu) at the Raincity Grill in Vancouver, the gravlax from Le Sélect in Toronto or a thali meal at Dasaprakash Hotel in Ooty. With so much great food writing around, there is also an ever-lengthening list of places I would travel to try the food – places I’ve never been, and those to be revisited, with the hopes of following up on the fabulous food recommendations I read daily. In addition, there are specific home cooks for whom I would travel the globe, just to taste their creations (I’m ready to head to Heidelberg, Michele). However, there are also meals I would come home for; anything cooked by members of my family, the roast beef sandwiches from our local German delicatessen, the homemade burgers from our “regular” pub, the ginger salad dressing from the sushi place in the city I grew up in … I could go on for days. These are the dishes I obsess over when I’m away – nothing tastes as good, nothing could satiate that yearning, but being home. Case in point, my single-mindedness entertained a colleague at the conference – she, by the way, is a great girl and one of the nicest people I’ve met in our industry. One evening, on the way to dinner, I spontaneously started babbling about asparagus soup. Not just any asparagus soup, but specifically the asparagus soup that was currently sitting in my freezer back home. I hadn't wanted to leave the asparagus in my fridge for the duration of my trip, and since I'd made this realization long after dinner, I made a batch of soup and froze it. For the entire elevator ride I was detailing this soup, extolling its texture, its freshness, its absolute green colour; I was in a state. At dinner, fate would have it that there was asparagus soup on the menu. Yet, I eschewed the idea of ordering it, lest it taint (or overshadow) my thoughts of my soup at home. Clearly I was fixated. Luckily, my colleague found it more amusing than manic. As you can assume, it was one of the first things I crammed into my greedy little mouth upon arriving back home. Next time, I’ll just bring a thermos. Inspired by a recipe by Roland Passot of La Folie on Epicurious, but it seems to be no longer available - this is my version.. Snap off ends of spears at natural breaking point, discard. On a rimmed baking sheet, toss asparagus with olive oil, salt and pepper. Roast in oven for about 6-8 minutes, until the asparagus starts to turn a bright green. Shake the pan to turn the asparagus, roast for another 4 minutes or so. The asparagus should be just starting to blister in places. When cool enough to handle, chop the asparagus into 2 inch lengths. In a saucepan over medium heat, melt the butter. When the butter just begins to foam, add the shallots and sauté until translucent and softened. Add the chopped asparagus and cook, stirring occasionally, for about five minutes. Stir in the cream and stock, and bring to a boil. Cook for 5 minutes. Stir in chopped spinach, cook for 2 minutes more. Transfer to the soup to a blender (working in batches if necessary), and purée until smooth. For a velvety texture, pass the soup through a fine-meshed sieve or chinois. You may skip this step if you’d like. Adjust seasonings to taste. Serves two generously, can be served hot or cold. • Instead of roasting, you could simply blanch the asparagus before sautéing. • I've also made this soup with 1 cup 18% and 1 cup stock, just because the store sells the cream in 250ml/1 cup containers. This soup can be made with heavy cream instead, if you want a more luxurious version. When I want a “lighter” version, I substitute 1/4 cup of 2% milk and use only 1/2 cup of the 18% cream. 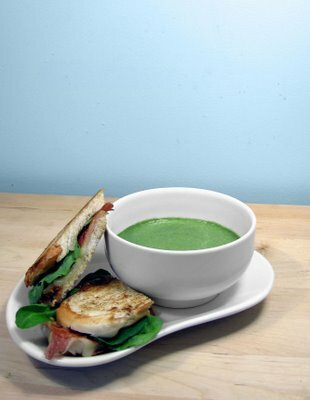 • If you use the frozen spinach, the soup will have a much more pronounced spinach flavour. 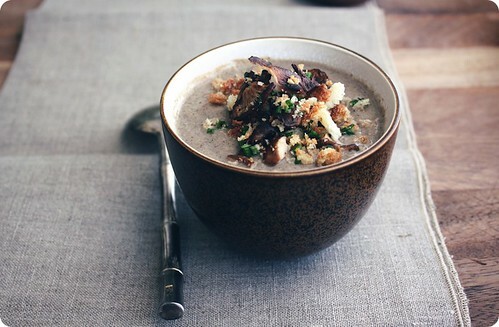 •This soup is lovely with a variety of garnishes — some options include; a seared scallop, crab, sautéed wild mushrooms with balsamic, chili oil drizzled popcorn (trust me), or use the same ingredients as in the panini to make a crostini to float on top. My own creation, but really, it’s a grilled cheese sandwich. In a dry pan over medium heat, fry prosciutto until starting to crisp. Remove from pan, and drain on paper towels. In the same pan, melt butter and olive oil. Spread the chèvre over two slices of bread, top with prosciutto. Place remaining slices of bread on top. Grill sandwich in pan, pressing down with either a panini weight or with back of spatula. Cook for approximately 4 minutes on each side, or until bread is toasted and the chèvre is beginning to soften. Remove from heat, drain on paper towels if there is excess oil. Open sandwiches and tuck in greens. Makes two.